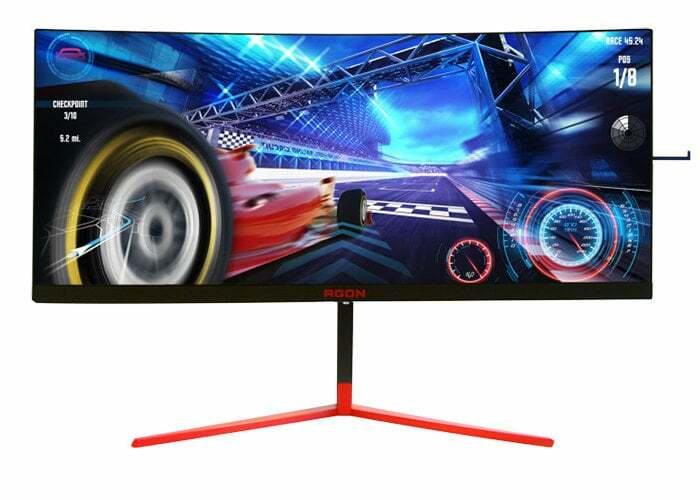 AOC has this week introduced a new gaming monitor in the form of the AGON 353-series which will be available in two versions supporting either AMD FreeSync 2 or NVIDIA G-SyncHDR certification. The new gaming monitor with NVIDIA G-Sync compatibility is expected to launch sometime during June 2019, but at the current time AOC has not revealed any launch date for the AMD FreeSync 2 HDR equivalent. What we do know is that the AG353UCG will feature NVIDIA’s G-Sync HDR as well as AMD’s FreeSync 2 HDR. The G-Sync HDR version, however, will be carrying a 512-zone full array local dimming for increased contrast. Connections on the redeeming monitor will take the form of HDMI 2.0, DisplayPort 1.4 ports together with and a 4 x USB 3.1 ports. Other specifications include 4K resolution, 1000 nits peak brightness in HDR mode, 1 ms (MTRT response time, or a rated 4 ms GtG) and a 200 Hz maximum refresh rate with support for AMD’s FreeSync 2 or NIDIA’s G-Sync HDR. Unfortunately, no information on pricing or worldwide availability has been released as yet, but as soon as information comes to light, we will keep you updated as always. The gaming monitor will also feature 100% coverage of the DCI-P3 colour space if colour accuracy is something you require together with a handy headphone hanger.